1612 - 17th Avenue S.W. Whether beginning anew, brightening your future, or scaling back, the purchase or sale of your home marks an important milestone in your life. With this significant move forward, guidance and protection is imperative, which is why you will choose to work alongside the person most qualified for the position - a certified and licensed real estate professional, backed by the #1 Century 21 brokerage in Calgary, Century 21 Bamber Realty Ltd. With over 30 years of real estate experience, we are a Grand Centurion achieving brokerage, dedicated to continually providing quality service and expert advice. Our office offers a convenient and central location for you and your clients to conduct business comfortably. Becoming an agent grants you access to our full-time in-house support system of Reception, Conveyancing, Marketing & Graphics, Administration and full-time Broker Guidance. We attribute our success to the honesty, integrity, and responsiveness of our agents and their clients. Together, we are Smarter. Bolder. Faster. ~ As the most recognized consumer brand name in the Real Estate industry, the CENTURY 21® System has a heritage of professionalism, dependability, and customer understanding which have become synonymous with the CENTURY 21 gold standard. You can expect the best from the CENTURY 21 Local Experts. Dedicated to continually providing quality service and expert advice, we strive to understand your goals and then adopting them as our own. Let us help you find your dream home or get a quick sale of your property at the best price possible. We look forward to assisting you with your next Real Estate transaction. 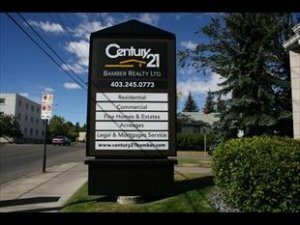 Calgary CENTURY 21 BAMBER REALTY LTD. 1612 - 17th Avenue S.W. Calgary, AB T2T 0E3 will help you find the home of your dreams and work with you to sell your current Calgary home. Becoming a home owner can be overwhelming as the terms used to describe real estate, negotiating offers and taking the proper steps to ensure a comfortable Calgary real estate experience is important. Calgary CENTURY 21 BAMBER REALTY LTD. Real Estate Franchise services to help you find TOP Calgary real estate agents and LOCAL Industry Experts. Working with licensed Calgary agents, Cochrane agents, Airdrie agents, Strathmore agents you can expect the fewest problems throughout the selling process of your home or investment property. CENTURY 21 BAMBER REALTY LTD. is not providing a Business Profile Video at this time.